Parma, 25 February 2014 --- VisLab, spin-off of the University of Parma, and Magneti Marelli have signed a technical-scientific collaboration agreement on the subject of intelligent vehicles and autonomous driving. The agreement calls for Magneti Marelli engineers to join a group of researchers from VisLab, in order to form a research team in Parma made up of about twenty members. The researchers’ aim is to develop and apply innovative technologies in the field of intelligent vehicles with autonomous driving and, more generally speaking, within the scope of Advanced Driver Assistance Systems (ADAS). The agreement also entails the development of demo vehicles with autonomous driving optimized for situations such as highway, urban and sub-urban areas and completely autonomous driving, based on sustainable technologies from a cost standpoint. Each individual situation has specific characteristics and requires a specific sensor architecture. Magneti Marelli has been working with the VisLab research group since 2007 on common projects in the automotive area, at both the national and international level, specifically on algorithms for the recognition of vehicles, pedestrians and road signs as well as on steroscopic vision. This worthwhile collaboration – with the definition of technological scenarios increasingly based on advanced connection between vehicles and infrastructures, and the establishing of the autonomous driving as one of the key solutions for intelligent and environmentally-sustainable mobility of the future – has thus become more and more important for both Magneti Marelli and Vislab, so much so that it has led to the recently signed agreement. The agreement combines the area of excellent research with the know-how of the world of production processes, of the complex dynamics of the automotive market and of the technological challenges of the future, from the standpoint of a global automotive component manufacturer. 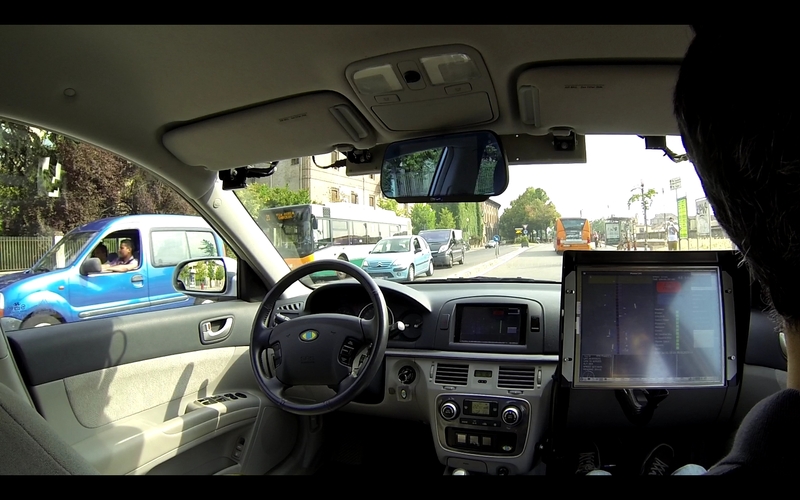 The autonomous driving solution foreshadows scenarios where control over the automobile can be gradually delegated to a set of systems installed on the vehicle – also supported by messages exchanged between the same vehicle and the infrastructures – capable of ensuring a univocal solution to the often conflicting problems of safety and reduced consumption and emissions. “We are currently witnessing a veritable change of paradigm in the world of automobiles – stated Luigi Piero Ippolito, Magneti Marelli’s Innovation Manager – the likes of which has not been seen for a long time. It is increasingly clear that mobility models will be changing quickly in pursuit of an increase in the level of automation, up to imagining completely autonomous vehicle driving with man-machine interaction models that are completely different from the ones we are familiar with today. To achieve this objective, new “perception” and “data fusion” technologies are needed, and Magneti Marelli and VisLab are sure to contribute in synergy to the development of these technologies”. For the past 20 years, the researchers at VisLab have been developing perception and decision-making systems that, once installed on the vehicle, allow it to drive itself automatically without a driver. The major milestones of VisLab include the ARGO project (2,000 km in semi-automatic mode along Italy’s motorways in 1998), participations in the DARPA Challenges, the first intercontinental journey in history from Parma to Shanghai with autonomous vehicles in 2010, and the autonomous driving demo in a city setting held this past July in Parma. In the university area, the research centre will generate excellent opportunities for both undergraduate and graduate students in the University of Parma, and will provide more high-level job opportunities in the field of applied research. VisLab, for more than 20 years, has been leading applied research in the field of artificial vision and intelligent systems, with particular attention to the field of road Environmental Perception by means of on board sensors. Some of the successful experiments carried out over the last few years by VisLab-mainly related to autonomous driving - are considered milestones in the history of vehicular robotics and machine vision worldwide. VisLab is proud of its many research collaborations with top level companies all over the world not only in the automotive field, but industrial, agricultural and mining and construction as well.